I know you’re drooling. Go ahead, I’ll give you a second while you wipe your chin. Doesn’t that look divine? I thought you’d like it. 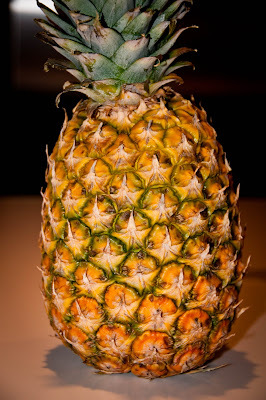 My recipe all started with this beautiful pineapple my sister brought me from the local farmer’s market. There were just so many possibilities for this little fella. Should I add him to my morning smoothie? I strongly considered it, but then would have felt guilty that I was the only one enjoying him. Should I make ice cream? Now that sounds delicious, but I am trying my best to watch my calories and be good. And then finally I decided I would use him in a grilled chicken recipe. 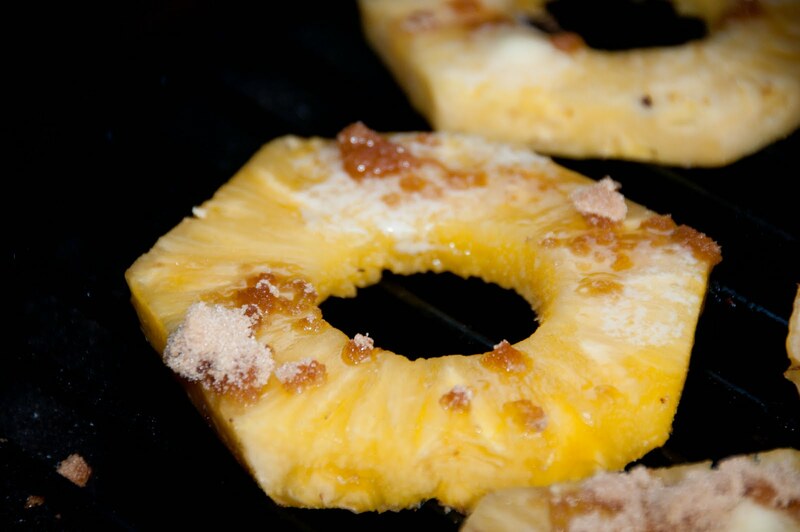 I do love grilled pineapple. The result was delicious! I knew y’all might like to try it, too. For this part, you just need chicken. Step 1. 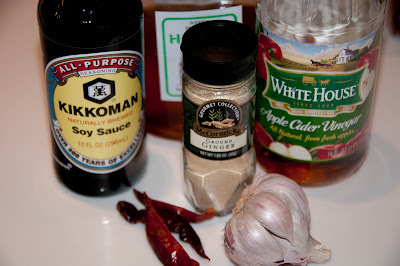 Combine all marinade ingredients in a small bowl. Step 2. Pour over chicken and let is soak up all this goodness. I suggest in a zip top bag so you can occasionally turn in the refrigerator to make sure the chicken is soaking up all the yummy marinade. For this picture, I show in my pretty dish. The zip top bag just didn’t look as pretty. Oh, you remember the saying, “Do as I say and not as I do,” don’t ya? See in the picture above those big ole hunks of red? Yep, you got it, I didn’t finely chop my red peppers. Just consider that what I meant to say, okay? Step 3. Refrigerate for up to 8 hours.The longer, the better. I promise. Step 4. 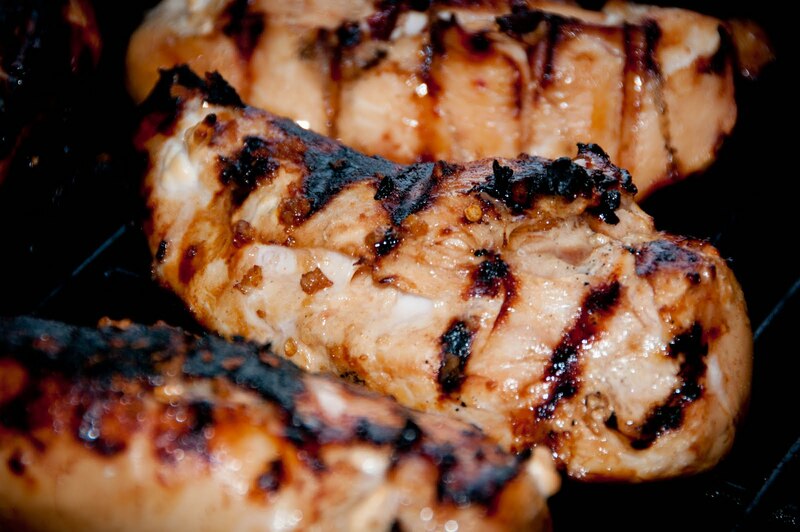 Place on grill, turning once, and until reaches an internal temperature of 165 degrees. 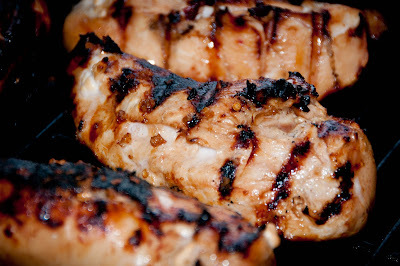 The temperature will continue to rise after you remove from the grill and allow it to rest. Step 1. 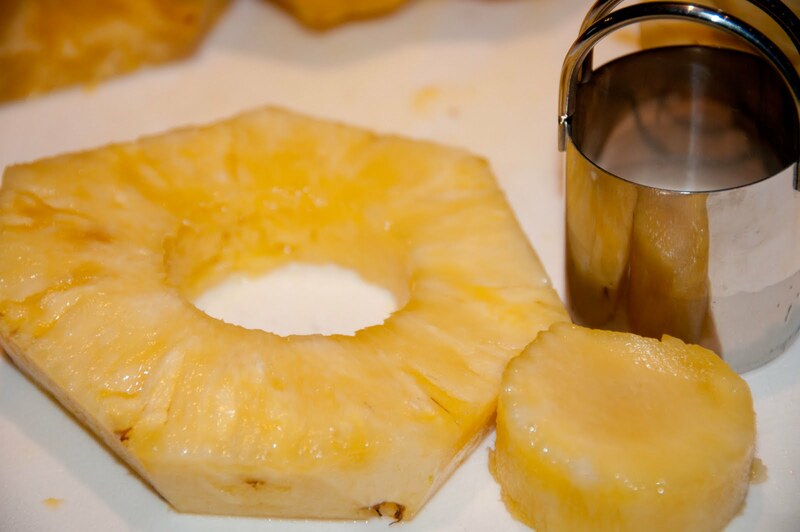 Peel and remove the core from the pineapple. I use a small pastry cutter for removing the core and to get those perfect circles every time, but a knife works well, too. Step 2. Lightly butter the top side of the pineapple slice and dust with brown sugar. Step 3. 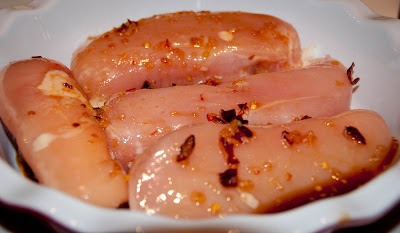 Place on grill and allow to cook for 5 to 10 minutes. Step 4. Remove from grill and serve. 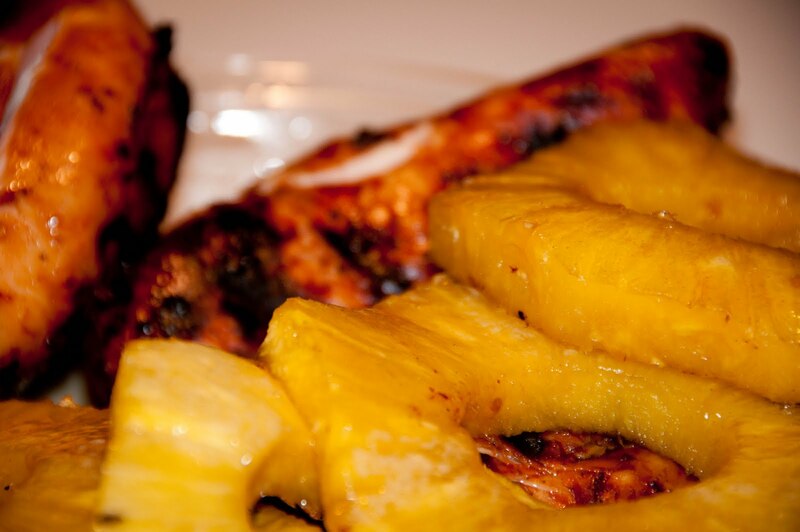 I would prefer to serve this with the pineapple on top of the chicken; however, my son does not like for certain foods to touch. Hence it is served on the side. 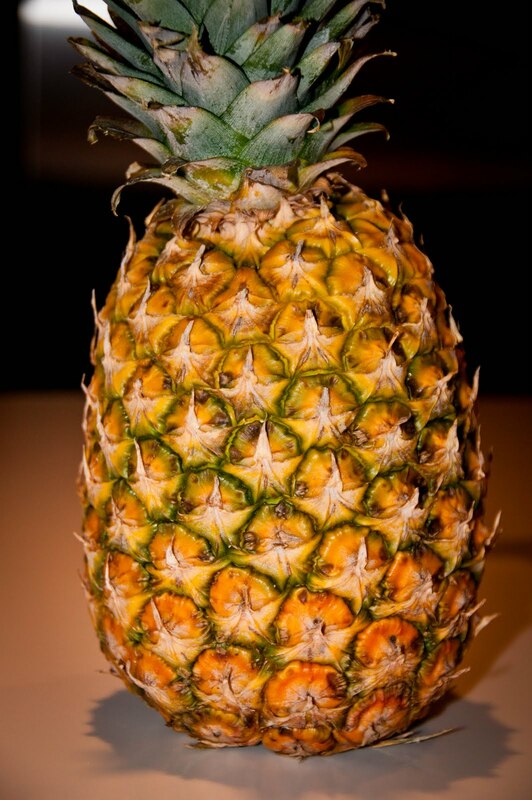 What would you have made with that pineapple? Robyn of Our Homeschool Home is a wife and work at home mom to a wonderful little boy who is quickly becoming not so little anymore! She recently left the corporate world and traded her Jimmy Choos for tennis shoes! She’s concentrating on her family, homeschooling, writing, cooking, photography and her online businesses that she owns with her family. She is a classically loaded, Kindle toting mommy sharing all her favorite classic books with her son. She thought she’d be bored when she left corporate America, she hasn’t found time to be bored yet! With temperatures already feeling like midsummer rather than late spring, I have had a plethora of a harvest from my garden. Already I have harvested cucumbers, squash, sweet banana peppers, tomatoes, violet green beans and more. With my bountiful harvest comes a desire to create and explore in my culinary endeavors. Tonight, we had a colorful and tasty chicken primavera made from leftover roasted chicken and some of the vegetables from my garden. Melt butter and olive oil in a large skillet over medium high heat. Add onions and squash and saute for three minutes. Add beans and tomatoes and continue to cook for three or four minutes, until color changes and vegetables have slightly softened. Add all herbs and salt and pepper to taste. Stir in heavy whipping cream and simmer on low heat for ten minutes. Serve warm over freshly cooked pasta of your choice. Serves six to eight. Last Friday, a few other bloggers and I were invited to the Milestone Culinary Arts Center in uptown Dallas, Texas for the unique and fun experience of learning ways to sneak vegetables into our children’s meals from Missy Chase Lapine, The Sneaky Chef, using Uncle Ben’s Whole Grain White Rice. This my friends is where Amy of Living Locurto and I Heart Faces, Holly of BurbMom, Laurie of Tip Junkie, one other chica (I feel like a dimwit for not remembering her name), and I teamed up and made Pizza Rice Balls, using sweet potatoes and carrots as the secret vegetable ingredients. Amy and Laurie played with each other’s balls (Amy’s were bigger than Laurie’s) while I exclaimed on Twitter: I knew pizza had bones (the crust), but I never realized pizza had balls too! And Mom Central called us Mom Influencers. Bet they wish they could take that back now! The most important thing about these pizza rice balls came when we popped them out of the oven–how did they taste? They looked scrumptious, but dude I worked in a health food store in Idaho while I went to college and let me tell you this: Just because it looks good, doesn’t mean it tastes good. Usually the better health food looks, the worse it tastes. Think my whole wheat bread that probably could be used as landscaping bricks. The Pizza Rice Balls a la The Sneaky Chef Verdict—Delicious! And only 100 calories per serving (but who’s counting calories, right?) Just for you, I’m adding the recipe to the bottom of this post. We also tried out several other recipes by The Sneaky Chef using Uncle Ben’s Whole Grain White Rice–a tuna cheese casserole, a pizza with rice crust, and Chocolate Rice Pudding. Here’s me, I mean The Sneaky Chef, stirring the pudding. What can I say? I’m a slacker. I had a great time and it was fun meeting new people and learning new healthful recipes. Plus, I liked joking with the real chefs and complaining because there was no Dr Pepper in the house. Now for the one thing besides how healthful and great tasting Uncle Ben’s Whole Grain White Rice is that they want you to remember: Uncle Ben’s Rice is the new black. I probably couldn’t have come up with a better slogan. 1. Prepare the UNCLE BEN’S® Whole Grain White Rice Sweet Tomato as instructed on the box. 2. Preheat oven to 450 degrees and generously spray a baking sheet with cooking spray. 3. To make the Sneaky Chef Orange Puree, drain the carrots and sweet potatoes and put them in a food processor with two tablespoons of water. Puree on high until smooth – no pieces of vegetables showing. Stop occasionally to push the contents to the bottom. If necessary, use another tablespoon of water to smooth out the puree, but the less water, the better. 4. Whisk together the egg, 1⁄4 cup of the Parmesan cheese, the spices, tomato paste, 2 tablespoons Orange Puree, and 2 tablespoons of the oat bran or wheat germ. 5. Add cooked rice and mix well. 6. Pour remaining Parmesan and oat bran/wheat germ onto a plate and set aside. 7. Using damp hands, pinch off about 1 tablespoon of the rice mixture and shape into small balls. Roll each ball in the oat bran or wheat germ and Parmesan mixture, coating fully. 8. Gently place the rice balls on the prepared sheet; generously spray the tops of the balls with more cooking spray, and bake for 5 minutes. 9. Using a spatula to loosen, turn the rice balls over, and then return them to the oven for another 5 minutes to brown on the other side. 10.Serve with salt and pepper as a handheld side dish or dip in marinara sauce (with additional added White or Orange Puree, of course!). Disclosure: Uncle Ben’s gave me three boxes of their Whole Grain White Rice to take home with me, along with a cool little doodad, aka USB flash drive, in the shape of an Uncle Ben’s rice box. I thought at first it was a Zippo, but I guess I was just having flashbacks to my teen years. Except my teen years included a lot of Hamburger Helper so I’m not sure where the rice box plays a part except that it is food in a box. We won’t go into the lighter part. Well at least not today (ask me tomorrow). Oh, they gave me an apron too.